This scrumptious French toast has “breakfast in bed” written all over it. Preheat oven to 450°. In shallow bowl, whisk together eggs, egg white, buttermilk, vanilla extract, sugar, cinnamon, nutmeg and salt. Spray 2 rimmed baking pans very well with nonstick cooking spray. Brieﬂy soak both sides of bread in egg mixture, then place in single layer on prepared pans. Bake 10 minutes or until bread is golden on bottom. With wide spatula, ﬂip bread and rotate baking pans between upper and lower oven racks. Bake 5 minutes longer or until bottoms are browned. 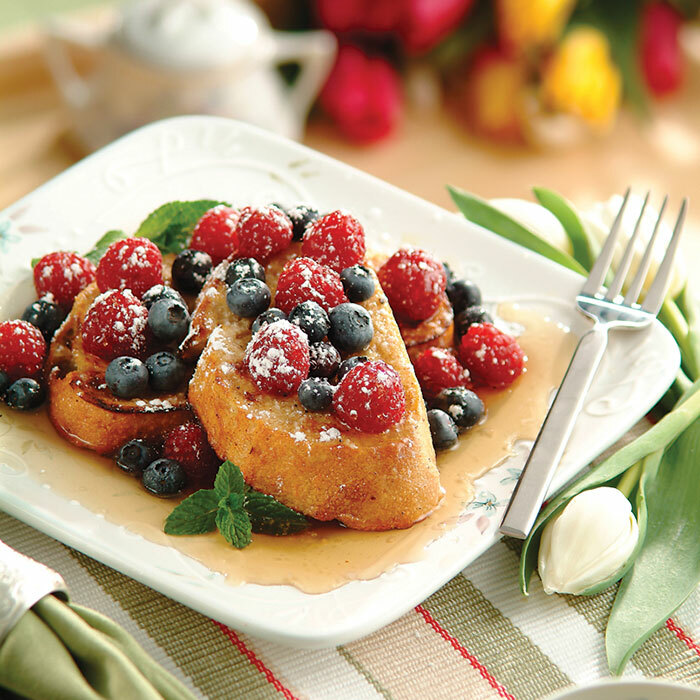 To serve, transfer French toast to individual serving plates; top with raspberries and blueberries. Drizzle with maple syrup. Sprinkle French toast lightly with powdered sugar and garnish with sprigs of mint, if desired.